This post has been sponsored by BumbleBerry Farms. All opinions expressed are my own. Delicate crepes are layered with a honey-infused pastry cream and chocolate honey spread for an irresistible dessert. There is a ‘point’ coming, I promise, just bear with me through a quick bit of context. Some weeks ago, on one of the few nights I actually managed to both get to bed early and then actually fall asleep – rarely do I do both – I was woken up just a few hours later by what sounded like cast iron being throttled around. My son having a late night snack, I figured. Just as I was dozing off again, cue the aroma of coffee followed by the sound of batter being whisked. By this point it was about 1 AM, and after I finally gathered the presence of mind to make the trek downstairs, what I found was my daughter making pancakes, with my son perched at the kitchen counter looking about as happy as…well, as happy as a lad about to indulge in syrup and butter-drenched cakes at one in the morning. 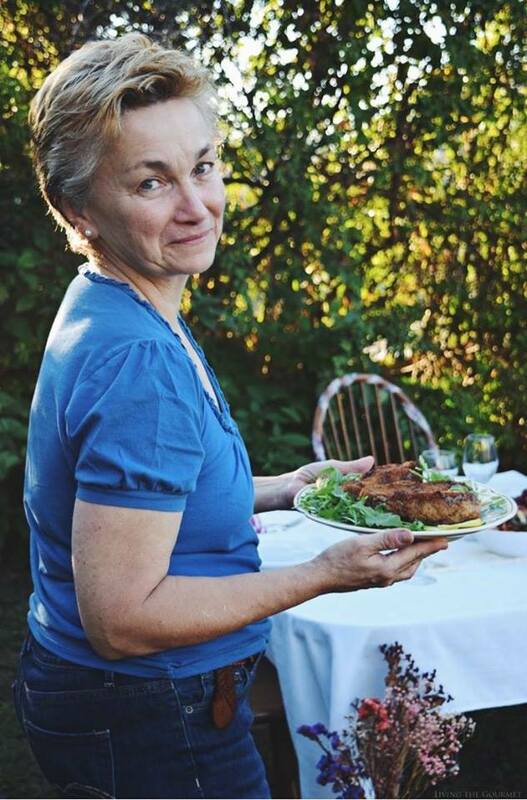 Indeed, certain foods are events in and of themselves. 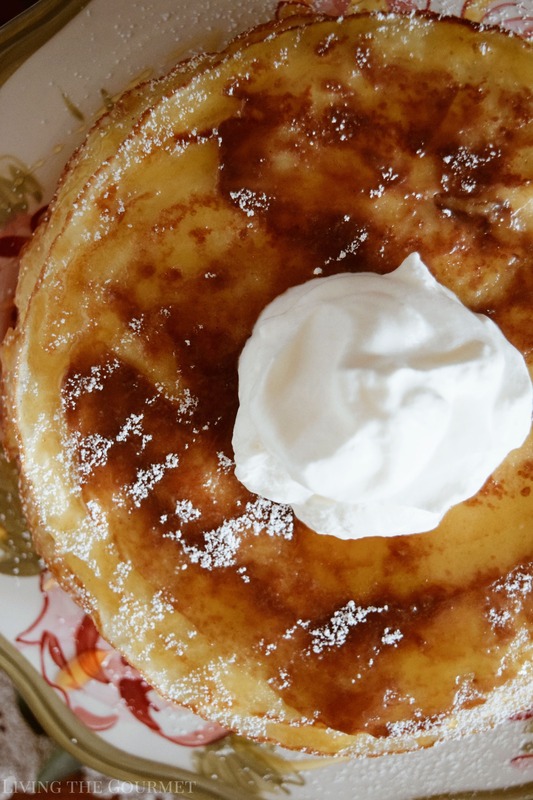 Pancakes, for example, can turn a drab morning into something akin to a small party, or a late night craving into something worth remembering. With that being said, we’ve all had breakfast for dinner at some point – or ‘breakfast for a midnight snack,’ in the example above. But what about breakfast for dessert? 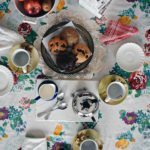 You’d probably think that ‘breakfast for dessert’ either signals that you’re accustomed to wildly unhealthy breakfasts or about to indulge in a woefully boring dessert. Naturally, you wouldn’t be faulted for assuming either. 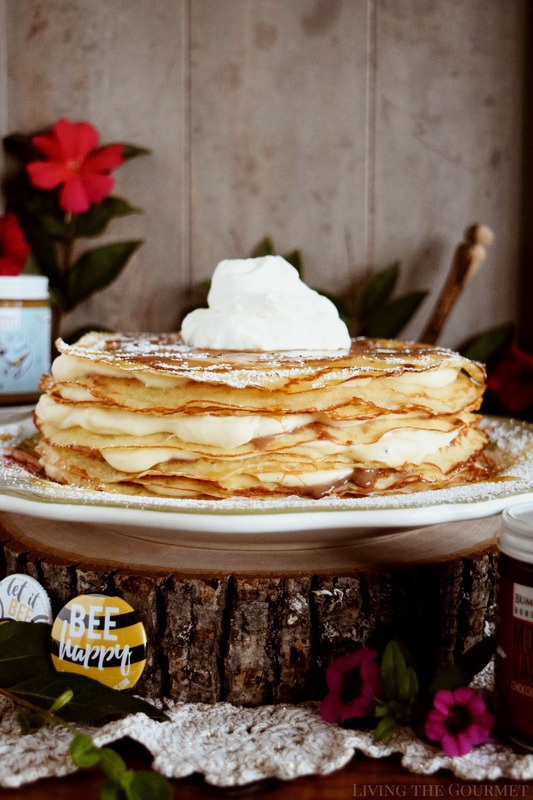 Take a look at this Honey Crepe Cake for example. When my daughter first brought it to the table for dessert, my son came to the table prepared with a bottle of syrup. Cue the ‘death stare’ from my daughter. However, this is one dessert where the ‘cover’ really doesn’t tell the story. 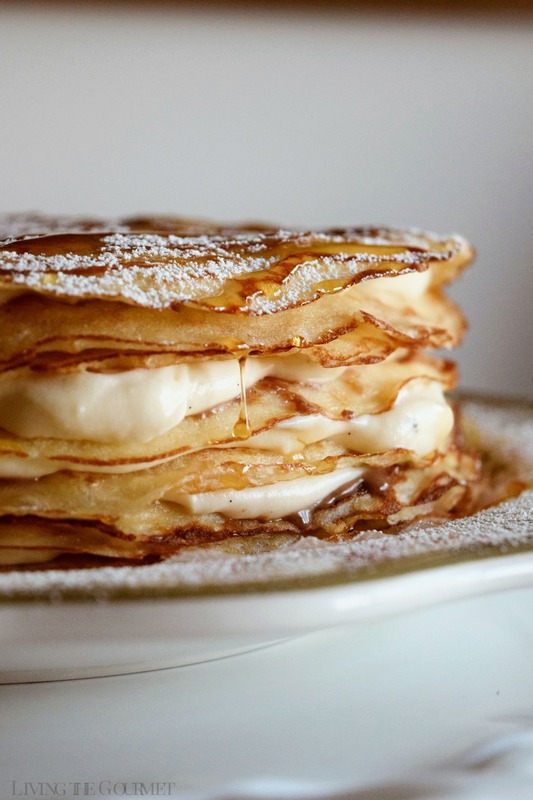 Looking a fair bit like a stack of very thin pancakes generously doused in cream, the ‘trick’ lies in what’s beneath. 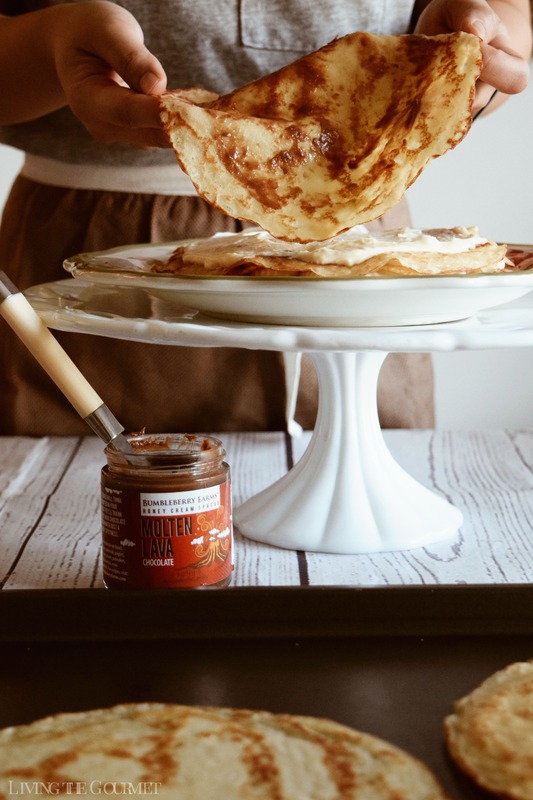 We start off with a fairly basic crepe recipe and whisk together flour, sugar, and salt, while gradually adding in whole milk, and then butter. We then strain the mixture to remove any lumps. After that, we heat a cast iron crepe pan with butter, and fill the bottom with the batter, and cook until the edges are golden, and repeat. Yes, we’re going to need a lot of crepes for this – so get comfy. Now, for the filling, we’re going to be using a standard pastry cream – the recipe for which is below. However, cream on crepes is just…well, cream on crepes. Instead, we’re going to be infusing the pastry cream with honey. Yes, honey in pastry cream- it’s about as delicious as it sounds. From there, it’s just a matter of layering. 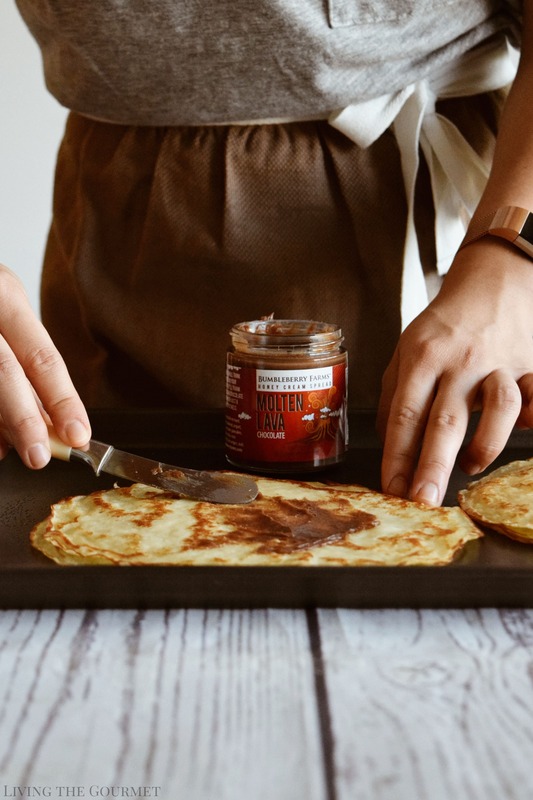 Start out with a crepe, lather on a generous helping of the BumbleBerry Farms Honey Cream Spread: Molten Lava Spiced Chocolate and honey pastry cream, then top that with a crepe, and repeat until you used all the crepes. I finish it off with an extra drizzle of honey and a dollop of cream, and there you have it. 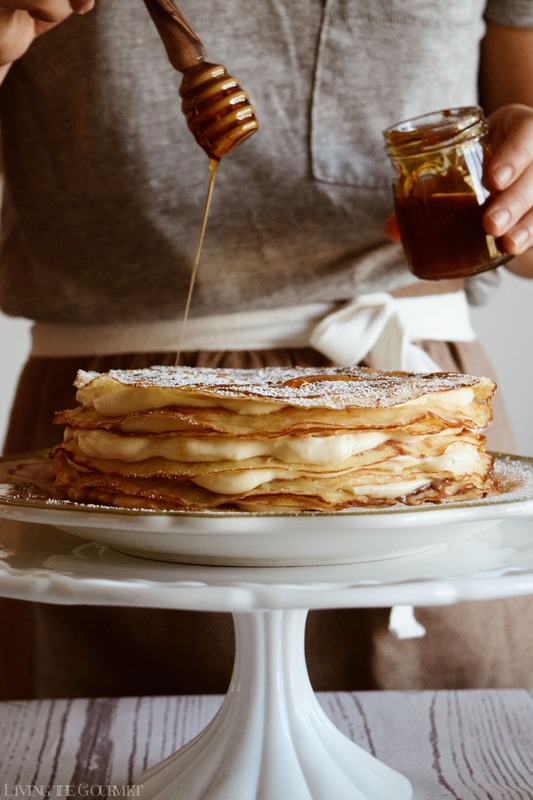 Breakfast For Dessert in the form of a supremely decadent Honey Crepe Cake. BumbleBerry Farms Honey Creams come in several different flavors, each in an adorable little jar that you’ll like to end up savoring once the honey cream is gone. Molten Lava, which is a spicy chocolate cream that’s great for adding complexity to sauces and marinades, or as a complement to salty snacks like popcorn, is probably among my favorites. The other flavors include Sticky Buns Cinnamon, Squirrel Crazy, which is maple honey cream and goes perfect with pancakes or biscuits, and finally Lovers Leap, which is the obligatory salted caramel, and is simply delicious in coffee, but honestly would probably taste delicious on virtually anything. In a separate bowl, whisk together milk, eggs, honey and vanilla. Gradually pour the milk mixture into flour mixture, whisking until smooth. Finally, whisk in the melted butter. Transfer the crepe batter to an airtight container and refrigerate at least 2 hours (can also be stored overnight). Lightly coat a 10-inch skillet with butter and heat over medium heat until just starting to smoke. Remove the pan from the burner and pour about 2 tablespoons of crepe batter into the center. Swirl to cover the entire bottom of pan, then return the pan to the heat and cook until the edges are golden and center is dry, flip and cook the other side, about 30 seconds per side. Slide the crepe onto a plate or baking sheet, then repeat this process with the remaining batter. You should get about 10-12 crepes. Let them cool once you are finished. In a medium-sized saucepan, stir together 2½ cups of the milk, honey, salt, and split vanilla bean. Bring the mixture to a simmer then turn the heat down to low. 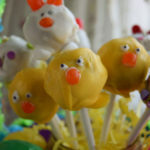 Meanwhile, whisk the cornstarch, flour, and egg yolks with the remaining ½ cup of milk. Be sure to add some tablespoons of the hot milk with the egg yolks to temper them. This keeps the yolks from cooking when you add them to the simmering milk. Pour the egg/milk mixture back into the remaining simmering milk. Be sure to stir constantly with a whisk, as the mixture will thicken to a custard-like consistency immediately. Remove from the heat and strain through a fine strainer into a bowl set in an ice bath under it. Stir in the butter and whisk until the butter has melted through and the custard is smooth. Place a piece of clingfilm over the top gently pressing down against the custard so that a film doesn't develop as it cools. Set in the refrigerate until it has cooled completely. Once the custard has cooled, simply fold in ½ cup of the freshly whipped cream until a pastry cream has come together. It should be softer but still hold it's shape. 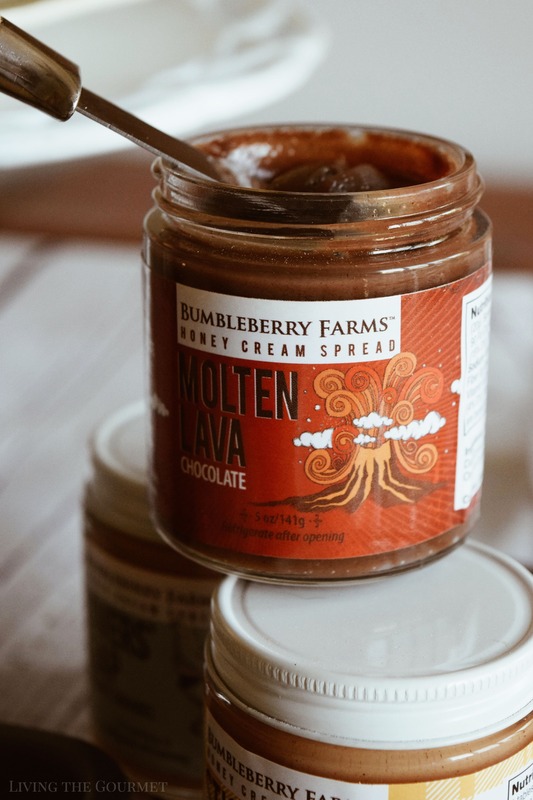 Place 1 crepe on a flat serving dish and spread the top with a little BumbleBerry Farms Honey Cream Spread: Molten Lava Spiced Chocolate (though any of their flavors would be delicious in this cake). Then spread a generous amount of the pastry cream over it and top with another crepe. Continue layering the crepes with the honey spread and pastry cream. To top it off, dust with confectioner's sugar, a drizzle of honey if desired, and a dollop of whipped cream. Store in the refrigerator before serving. Enjoy! For freshly whipped cream, simply whip 1 cup of heavy cream in a chilled metal bowl with a spoon full of confectioner's sugar. Beat on medium speed until firm peaks have formed. Reserve ½ cup for the pastry cream and ½ cup for serve over the crepe cake. *Prep Time does NOT include Inactive Time. Naturally, BumbleBerry Farms also has a variety of honeys to offer, including flavored honey such as Raspberry Honey, Orange Blossom, and Avocado – yes, avocado. These crepes look fantastic! 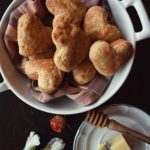 I love honey - we are part of the local bee association and so have lots of locally available honey. We don't tend to drizzle it on pancakes and now I'm wondering why. but honey flavoured pastry cream sounds even better! This is such an elegant crepe cake, I really love this idea. Its so beautiful to serve and I bet everyone went nuts over the taste! That is a luxury!! I love how delicious that looks and the flavors of honey and cream.. oh you have been drooling. I have to make this one-weekend brunch. So yum. What a beautiful cake -- I love that you used crepes for the layers. The filling sounds amazing -- something that everyone in our family would love. This would make a lovely brunch recipe. Next time we have an early morning gathering this is on the menu. I love honey!!! I don't know what I want more, this cake or all those adorable jars of honey! 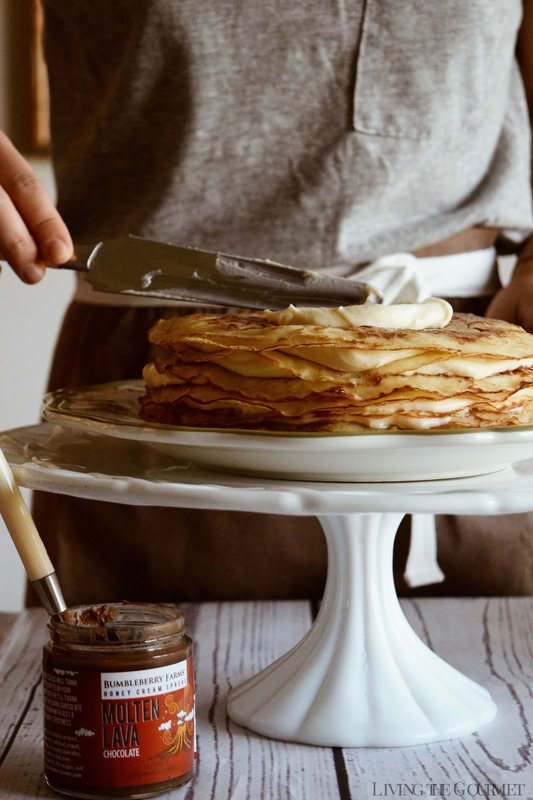 I've never tried a crepe cake, but I am going to be dreaming about this one! I have always wanted to make a crepe cake. This looks amazing, I would have a hard time keeping my hands off of it! I love crepes. I've never had a cake made out of crepes before, knowing me I'd eat all of the crepes long before they made it to the cake. Beautiful, luxurious and insanely decadent! This creation won't last long in my home. Your pictures are so beautiful, simply amazing. 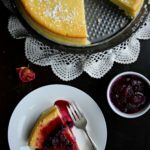 This delicious gorgeous crepe cake I love honey this make great treat for my kids. I don't think this will last in our house. Oh goodness, this looks absolutely amazing. I'm going to have to give this recipe a try soon. Crepes are one of my favorite dishes, turn it into a cake and it looks incredible.